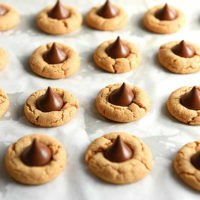 Peanut Butter Blossoms combine a simple peanut butter cookie with a little chocolate kiss plopped right in the middle for an especially delicious sweet bite. 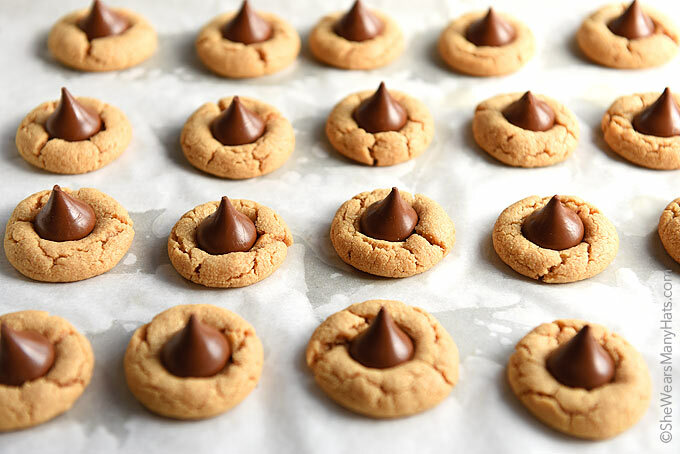 These little peanut butter kisses cookies are so easy and quick to make, and you probably have all the ingredients on hand. Four ingredients and a little bit of time is all it takes. And, if you are baking with children, Peanut Butter Blossoms are the perfect for little hands to make. Begin by lightly beating an egg in a mixing bowl. Add in peanut butter and sugar and beat until smooth. Next, use your hands to form 3/4-inch balls of dough. Place on baking sheets about 1-2 inches apart and bake for about twelve minutes. 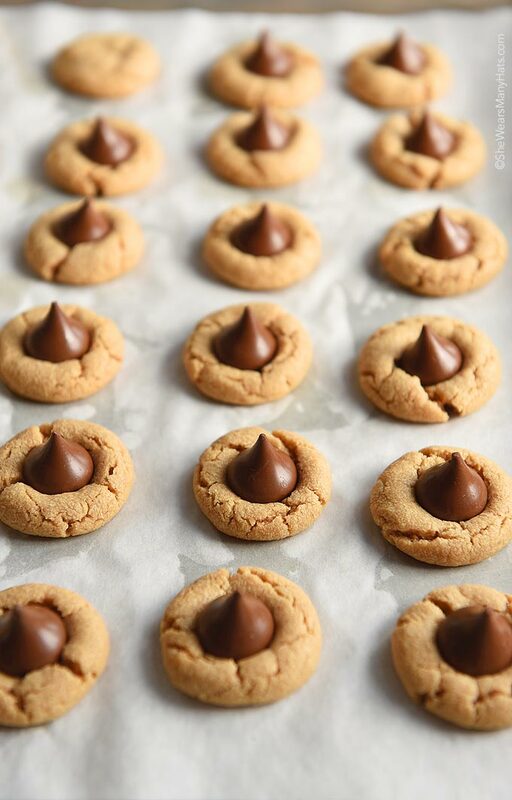 Remove the baking sheet from the oven and place an unwrapped chocolate kiss in the center of each cookie. Let the cookies cool for at least five mintues (if you can wait that long), then enjoy! Easy Peanut Butter Blossoms are perfect for sharing or snack time for a school, church or club event. Or perhaps you have a bake sale, a party, or just want to make a sweet treat for someone special? These easy Peanut Butter Blossoms won’t disappoint. Enjoy and happy baking! 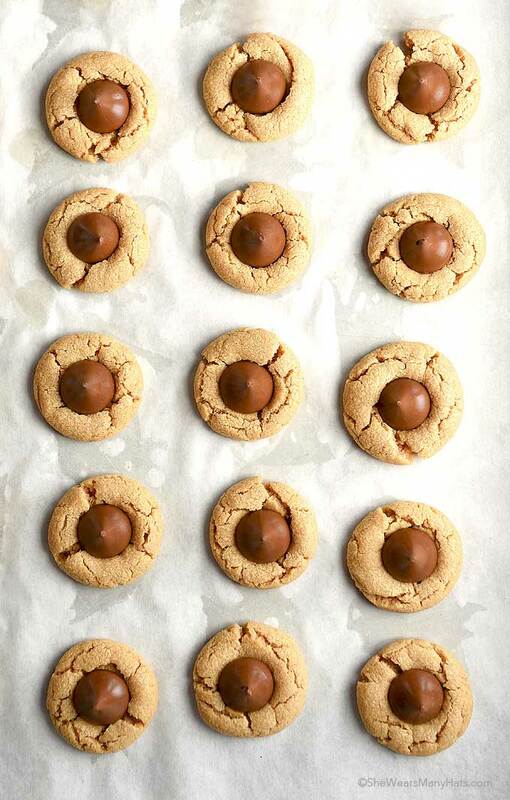 A delicious little cookie treat made with peanut butter and chocolate kisses. It's gluten-free too! In a mixing bowl lightly beat egg. Add peanut butter and sugar, beat to combine well, until smooth. Form dough into 36 balls about 3/4-inch round. Place dough balls on prepared baking sheets spaced 1-2 inches apart. Bake at 350-F degrees F for 12 minutes. Remove from oven and immediately place an unwrapped chocolate kiss in the center of each cookie. Cool on cookie sheet for 5 minutes, then transfer to cooling rack to cool completely. Originally posted December 19, 2014. These are awesome. You can’t beat four ingredients. Just amazed they are gluten free. 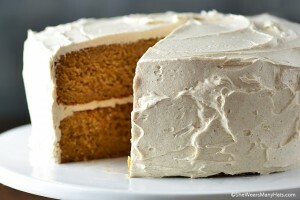 I will definitely be sharing this recipe with my gluten free friends! Such a simple treat for a gluten-free option. These are always a big hit with my family, especially during the holidays. Can I make these without the hershey kiss? I dont have any here, and I know my parents wont take me shopping. Yes you can. They may not need to be baked as long. Check on them while baking to see when they are ready. These are alwsy a big hit when make them. Definitely a classic.